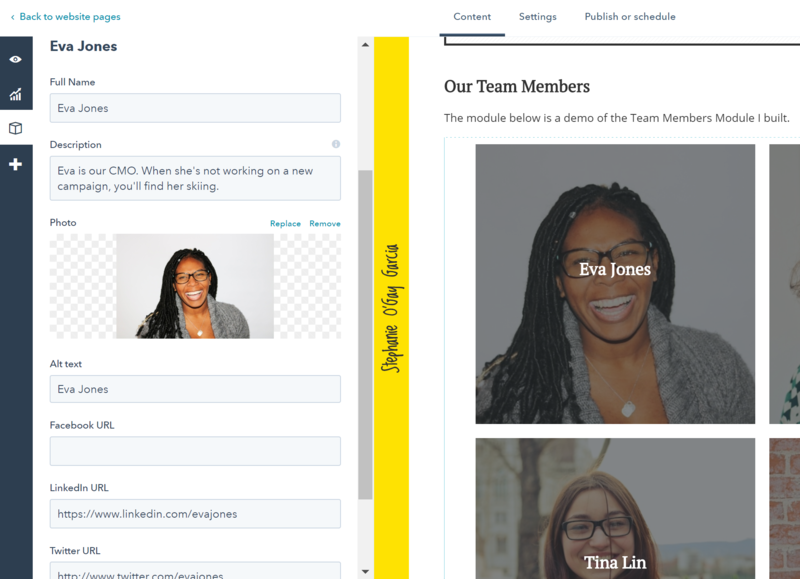 For my module, I chose to build a more clean and modern version of the Team Member module. You can preview a demo of the module here. 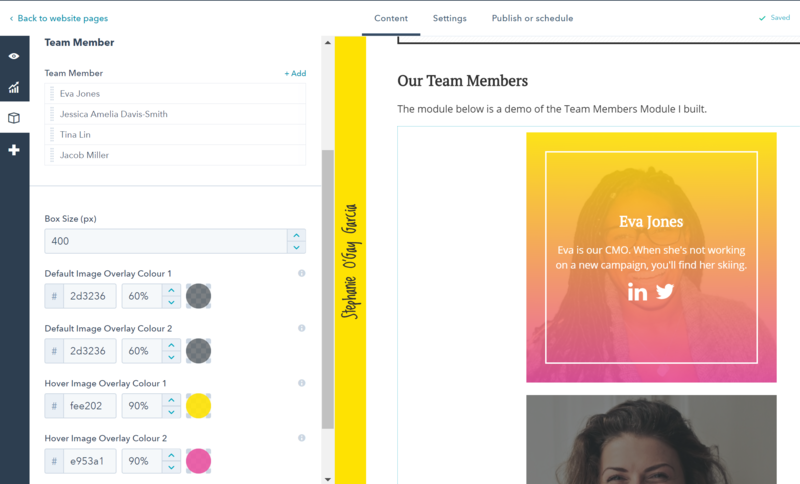 The module allows you to quickly add as many team members as you like and uses a responsive grid to organise them on the page. Regardless of how many you've added, they will always distribute nicely depending on the size of your box, the number of team members and the screen size. There are several elements you can easily customise from the editor. You can update the size of the boxes, the default colours over the person and the colours that will appear on hover. By the default colour, I'm referring to the black overlay you can see over each photo (this allows you to easily read their name). 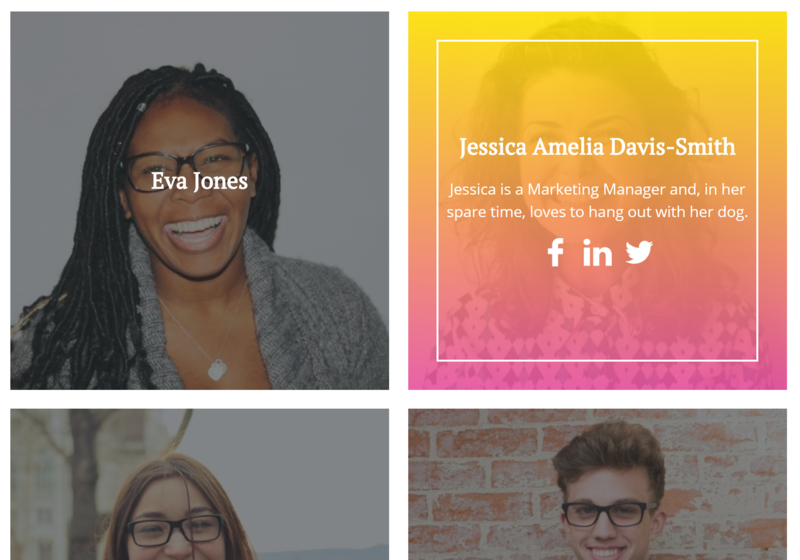 The hover colours appear when you hover over the team member (in the case below, yellow and pink to match my site). Each allows for two colours to create a gradient effect - adding the same colour to both the 1 and 2 fields will let you apply a single colour. 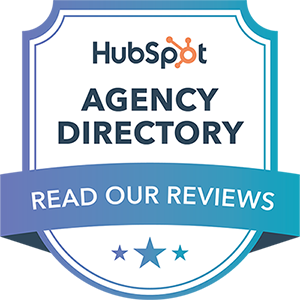 At this time, the module isn't available anywhere although it will most likely be available on the HubSpot Marketplace soon (check out my Blog RSS Feed Module I added to the Marketplace also). However, if you're interested in learning more about the module or adding one to your site, let me know!